Seems like just last week we were eating roasted vegetables and opening presents from loved ones. But if you’re wanting to take a Christmas getaway this year, it’s best to book early as many places often sell out by March. Here are our suggestions for Christmas 2019. Europe is filled with gorgeous castles, and what better time to live life like a fairy tale than Christmas? We suggest a castle near Salzburg, Austria! Not only are you practically guaranteed a white Christmas, but the atmosphere in this gorgeous old town is magic. Head down to the local villages for gorgeous European Christmas markets, with plenty of mulled wine to warm your body and your heart. Remind yourself of the history of Christmas in the city where it all began – Bethlehem. Join thousands of pilgrims from right around the world to celebrate the birth of Jesus Christ. Visit the Church of Nativity and participate in Midnight Mass on Christmas Eve in the place where it is believed Jesus was born. It will certainly be an experience you’ll never forget. Peregrine has a limited-edition tour of Christmas in Bethlehem for 8 days from $4,340*pp. 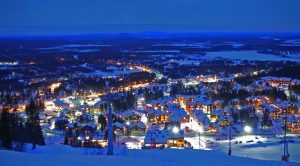 If a classic white Christmas is what you are after, Lapland is the place to see it. Experience real Christmas magic at Santa Claus Village, meet real reindeer and explore Santa Park. For the grown-ups, we suggest an overnight stay in an igloo or glass-roof cabin for a chance to see the Northern Lights and appreciate the magic of snow. In addition, thrill-seekers will be happy with the large variety of places to ski, snowboard and even snow-mobile! If the many, many corny Netflix Christmas movies taught us anything, it is that New York at Christmas is magic. We wouldn’t disagree – there’s something charming about this city early in winter. Ice skate at Rockefeller Centre, hire a bike and cycle around some of the most famous neighbourhoods and catch a show on Broadway. There is always something to see and do in the city that never sleeps! There is nothing wrong with your typical Aussie Christmas – salad and seafood by the pool in your board shorts and thongs. Spend your Christmas Day on one of Australia’s best beaches, soaking up the sun and splashing in the water. Rent a big house and enjoy the company of friends and family, or sneak away and avoid the relatives in a little cottage.